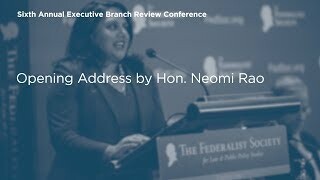 Neomi Rao serves as a United States Circuit Judge of the United States Court of Appeals for the District of Columbia Circuit, appointed by President Donald Trump. She is a former administrator of the Office of Information and Regulatory Affairs, which is an office in OMB focused on regulatory review. Judge Rao is also a former professor of structural constitutional law, administrative law, and legislation and statutory interpretation at the Antonin Scalia Law School at George Mason University. Judge Rao founded the Law School’s Center for the Study of the Administrative State and focused her scholarship on the political and constitutional accountability of administrative agencies and the role of Congress. Additionally, Judge Rao’s comparative analysis of the use of dignity in constitutional law has been widely cited in the United States and abroad. She also served as a Member of the Administrative Conference of the United States and on the Governing Council of the ABA Section of Administrative Law and Regulatory Practice. Prior to joining the Law School, Judge Rao served in all three branches of government. 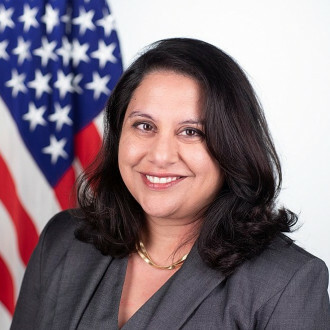 She served as Associate Counsel and Special Assistant to President George W. Bush. Judge Rao also served as counsel to the U.S. Senate Committee on the Judiciary, where she was responsible for judicial nominations and constitutional law issues. In between government service, Judge Rao practiced in the London office of Clifford Chance LLP, specializing in international law and commercial arbitration. After receiving a B.A. 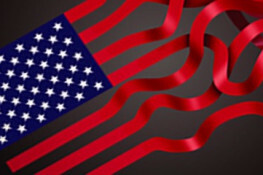 from Yale University and Juris Doctorate from the University of Chicago, Judge Rao clerked for Judge J. Harvie Wilkinson III on the U.S. Court of Appeals for the Fourth Circuit and for Justice Clarence Thomas on the U.S. Supreme Court.